Almost 100 years ago, Marcelina Manoel da Graça, otherwise known as “Daddy Grace,” founded the United House of Prayer for All People. With this congregation began a new era of gospel, a new passion for the Holy Spirit, and—most of all—a new sound of music coming from a new style of bands. It’s the kind of band that Charlotte’s Cedric Mangum knows very well. He’s the leader of the popular gospel brass shout band, Mangum & Company, and he has been moved by the music since he was seven years old. He started on the drums and ended up lead trombonist. In fact, Mangum knows all the shout instruments. At 13, he became the leader of the Charlotte Mother House’s legendary Bailey Clouds of Heaven. Today, at 55, he still plays that role. Mangum & Company is a hearty combination of 20 to 30 outstanding musicians from congregations across the Charlotte area. 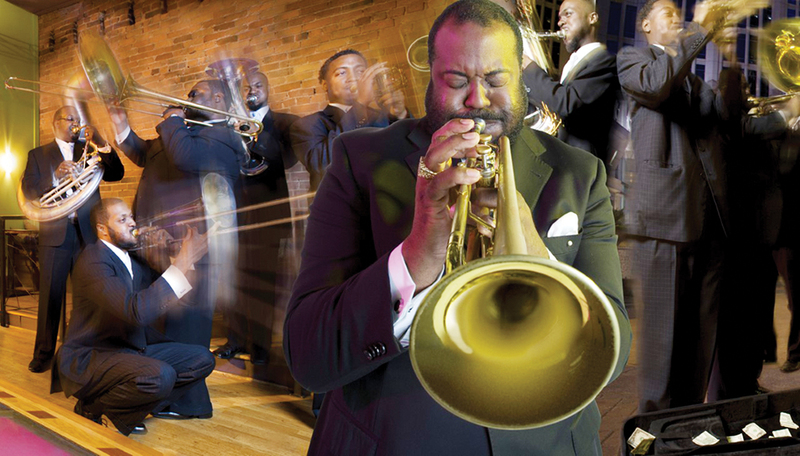 Their music boasts an African American flair that focuses on brass instruments associated with jazz and gospel hymns. And soon, Mangum & Company will have the opportunity to share their heavenly sound with thousands of people at the 76th National Folk Festival, a traveling festival that celebrates America’s incredibly diverse cultural traditions; it’s coming to downtown Greensboro from September 9 – 11 for the second year of a three-year residency. North Carolina has been a hotbed for “shout bands” ever since Daddy Grace left his mark in Charlotte in 1926, with approximately 20 bands sharing their joyful noise across the state. The Queen City alone has 17 United House of Prayer congregations and nearly as many shout bands; Mangum & Company is made up of “all-stars” from those congregational bands. Mangum is part of a congregation that stands firm today, one of about 130 congregations nationwide. What keeps shout band musicians so resilient is their undeniable faith in God and his mercy. Mangum truly believes that through his music, he is a vessel of God.